"The Conservatives on Wandsworth Council should be ashamed of themselves. Making local children pay to play in our parks is not something I would have supported during my time as a Conservative councillor, no matter how hard the party bosses were pushing” said Ms John-Richards (pictured left with Lisa Smart). 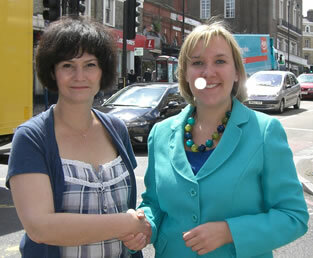 She continued, “It is very clear that the Conservatives in Wandsworth are taking their support for granted. Their councillors nod through high rise developments and other unsuitable planning proposals and completely ignore the views of their constituents. “Susan is widely respected for her many years of community service in Wandsworth and her independent-minded stance and so I am particularly delighted to have her support for my campaign. Lots of people who have voted Conservative before have told me that they want an independent voice on the council, not just another identikit councillor to do what town hall bosses say”.